Growing up just an hour from Lancaster County, I had experienced this beautiful area in small doses over the years. As a child, I took school field trips to Amish farmland to see livestock auctions firsthand. Then as a teenager, I visited the nearby Pennsylvania Renaissance Faire with groups of friends. In the years after that, I found myself making occasional voyages to the outlets for discounted bargains and shopping sprees. But I always wanted more. I wanted to experience Lancaster County more personally, to really get a sense of what Lancaster was all about. Fortunately, I recently had the opportunity to get an up close and personal experience of Lancaster in the best way possible: by taking a guided tour on a scooter. Not only was this a unique way to see Lancaster, the two-hour tour included several delightful stops along the way. Fortunately, I recently had the opportunity to get an up close and personal experience of Lancaster in the best way possible: by taking a guided tour on a scooter. When I and my best friend Jen first arrived at Strasburg Scooters, we were greeted warmly by the owners, Marc and Nikki Crusemire. 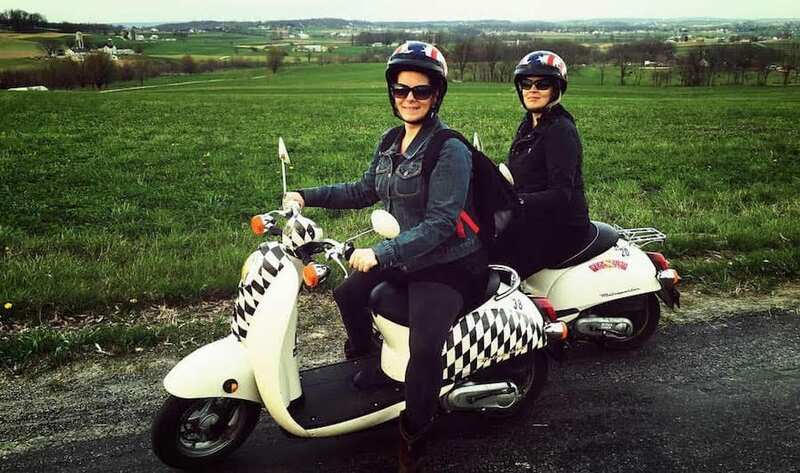 The duo had just celebrated the fifth anniversary of their scooter tours business, a business that started as scooter rentals but quickly became guided tours when tourists proved navigationally challenged. The Crusemires aim to educate tourists on Amish culture and local traditions, and they maintain close relationships with Amish families in the area. Their number one goal is to make sure people have a great time on the tour, whether they’re riding solo, as a couple, or as a family. The Crusemires were informative, with a great sense of humor, and I instantly felt we were in good hands of skilled tour guides. Jen and I were next given helmets and taken outside to each select a single-seat scooter to use for the tour. A couple from Connecticut, as well as a couple from upstate New York, joined our tour, making it a comfortable group of six. Marc gave an informative demonstration of how to use the scooter, and then each of us were given a test drive in the parking lot, before we headed out on the road. Scooters are amazingly easy to operate. Though I had previously been a passenger on the back of scooters and motorcycles, I had never been the actual driver before. It was exhilarating to be driving a scooter on the open road, with the sun on my face and the wind in my hair. Seeing the famous Amish landscape on all sides of me was a beautifully breathtaking experience, indeed. It was exhilarating to be driving a scooter on the open road, with the sun on my face and the wind in my hair. We first stopped at an Amish schoolhouse, and Marc explained how the Amish are typically educated. Marc was clearly knowledgeable, and he was able to answer our questions. We then headed back out on the road. Marc led the way driving a three-wheeled Scoot Coupe, which has seats for two. We traveled along as a group with a safe distance between each other, keeping to the wonderful back roads of Lancaster County farmland. We passed very little traffic and saw several traditional Amish horse and buggies along the way. I was surprised by all the rolling hills we encountered, and once I figured out that letting the scooter coast downhill while lightly pumping my brakes, it only added to the excitement of the journey. Our next stop was at one of Lancaster’s historic covered bridges that stretched over a creek. As Pennsylvania is home to more than 200 covered bridges, 27 of these picturesque bridges are found in Lancaster County. It was great to see one up close, especially for the out-of-state folks in our group. This was also a great place to stop and stretch our legs, and we all took photos on the bridge. Marc filled us in on the history of covered bridges, which was another great aspect of the tour. As Pennsylvania is home to more than 200 covered bridges, 27 of these are found in Lancaster County. Back on the road, I was impressed with the expanse of undeveloped land in Lancaster County. It was so refreshing to see a throwback agricultural lifestyle in action. We passed several farms throughout the tour with horse-drawn plows, tilling the soil in preparation for planting season. We continued on down the road toward our last stop, an Amish farm. Marc and his wife Nikki are friends with the Amish family who own the farm and made introductions as soon as we arrived there. As we parked our scooters in the driveway, a bustling group of adorable Amish children quickly ran over and began climbing on them, laughing with enjoyment all the while. We soon met the six Amish children who lived on the farm, and they were especially happy to show us around their property, introducing us to their horses, sheep, and chickens. We also received a tour of their barn where several traditional horse-pulled plows and buggies were stored. This stop was a very special part of the tour, as the family was especially gracious to host us and answer questions about their Amish way of life. As the sun slowly began to sink in the late afternoon sky, we said our goodbyes. We hopped onto our scooters one last time and headed back to Strasburg Scooters headquarters. 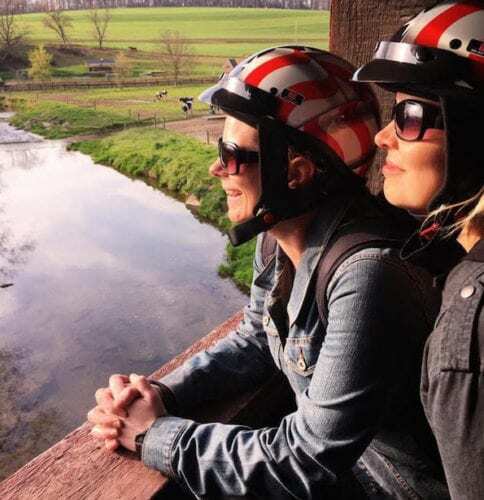 I marveled at the idyllic vista of endless farm fields and grazing pastures whisking by me as I drove along and thought, “Wow, how great this is to be able to ride through here and see it all firsthand.” This wasn’t just a tour. It was a true adventure. This wasn't just a tour. It was a true adventure. Overall, Strasburg Scooters was the perfect way to encounter Lancaster County and really appreciate the Pennsylvania Amish lifestyle. I would heartily recommend the tour to anyone. We can get up close and personal. It's the definition of an experiential tourist. More Scootin’ with Fox 43 News!